Fairfield Warde's Stacey DiLeo goes after an errant throw as Fairfield Ludlowe's Emily Nelson slides into second base during the softball game at Warde on Friday, May 13, 2011. The Fairfield Warde vs. Ludlowe softball game is bigger than just an ordinary game for both teams. This year, it was the Mustangs who made all the plays and pushed closer to an FCIAC playoff berth. Warde's Alyssa Borowy had four hits and drove in four runs and Summer Anderson socked two hits and scored a run as the Mustangs moved into a tie for the final FCIAC tournament spot with a 6-4 win over Ludlowe. "We were confident that if we hit the ball, that'd be the key to the game," Warde coach Gary Quiricone said. "We knew it would be a close game." "I love playing against these girls," Borowy said. The Mustangs moved into a tie with Wilton for the eighth playoff spot. Warde needs to keep winning though, because the Warriors own the tiebreaker due to a 4-3 loss on April 11. "This is a huge confidence booster for us," Quiricone said. Elise Perazzini had three hits and scored a run for the Falcons and Emily Nelson had two hits and scored a run as the Falcons fell into a tie for ninth in the FCIAC, a game back of Warde and Wilton. "We had our opportunities," Ludlowe coach Tony Samuelian said. "It could have gone either way." Warde took the lead from its half of the first inning when Stacey DiLeo walked, reached third on a single by Anderson and scored on Borowy's RBI single. "She's at the top of her game right now," Quiricone said of Borowy. But the Falcons pulled ahead in the top of the third, when Perazzini and Lizzie Knuff scored on a two-RBI single by Nelson. "This team is a tough team to read, because they are young," Samuelian said. "The momentum moved back and forth." That was the only lead of the game for Ludlowe, though as the Mustangs scored two in the bottom of the third. 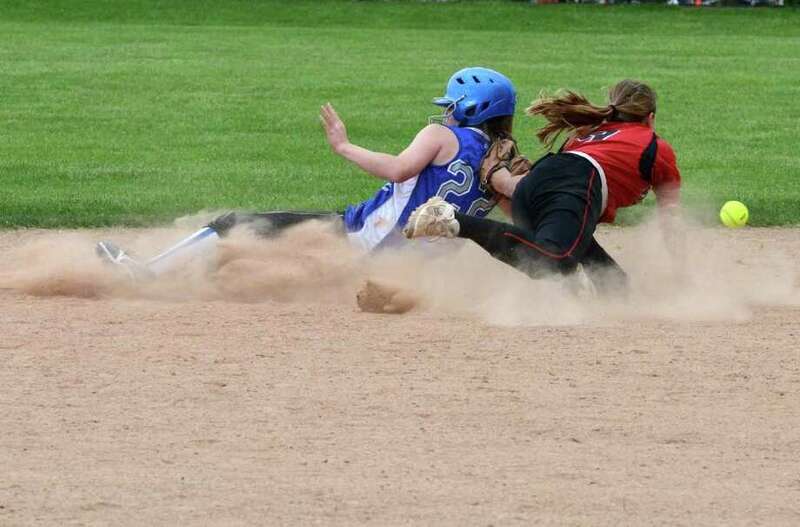 Courtesy runner Julia Palmieri, who was running for pitcher Heather Vanderheyden, scored on Borowy's triple. Borowy then scored on a single by Kitty Caissy. "It was really great for me to come back today and hit," Borowy said. Ludlowe rebounded again in the fourth. Maggie Lapolla walked and scored when Perazzini singled her home. The Falcons had the bases loaded with one out, but only managed the single run. Vanderheyden struck out Meredith McGann and then caught a huge break when Knuff's hard-hit line drive hit Vanderheyden's foot and bounced straight to McCartney who tagged the base just before Knuff reached for the third out of the inning. "It was a great play by (McCartney)," Quiricone said. "It was a close game." Vanderheyden was shaken up, but stayed in the game. "She's a tough kid," Quiricone said. "She was sore, but as long as she was throwing the way she can, we were going to stick with her." "I can not believe she came back from that," Borowy said. The Mustangs tallied two more runs in the fourth when Borowy singled home Michelle Treglia and Anderson with a two-out single. "We hit the ball really well today," Anderson said. "I'm so glad we came out in the end." Ludlowe scored a single run in the fifth when Nelson scored on a double by Amanda Brenner. But the Falcons would not get closer than that, and Warde tallied an insurance run in the fifth when Shannon Squier scored on a wild pitch. Warde beat Harding on Monday and will then host Danbury and visit Darien next week to close its season. "I think Danbury and Darien should expect our best," Quiricone said. Ludlowe fell to St. Joseph on Monday 5-1. The Falcons will travel to Staples on Wednesday and close their regular season to Ridgefield to close its regular season. "This was big," Samuelian said. "We've got a tough stretch going."